Gigantic space ships are expanded enormously through a similarly huge theater screen. 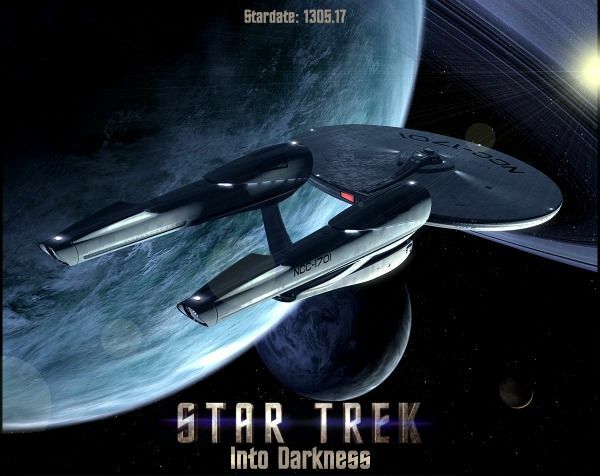 But other than amazing graphics, there’s so much more which Star Trek Into Darkness offers. Where man despairs to mold himself a shape? "Why does man seek for life in the lifeless?" he now has his own and that world to find. and dust awaits his homely return. For one, it still follows the same old adventure-filled formula which the well loved Star Trek TV series uses. But you won’t find the old characters in this movie except for a cameo appearance of the original Mr. Spock and Christopher Pike’s demise to give way for a new captain of the U.S.S. Enterprise, James Kirk. The latter led the team towards explorations but ended up interfering with the fate of an entire planet by hindering a volcano’s eruption and allowing the natives to see the Enterprise flee. This was because Kirk wanted to save Spock’s life despite the latter's protestations. Speaking of Spock, if you grew up watching the T.V. series, you will be surprised by how he had finally learned to express emotion and cried over the death of Kirk, the new captain and went after Khan, this movie’s nemesis. Khan is one of the 72, 300 years old, genetically engineered humans with super abilities encapsulated in cryogenic tubes and made to sleep in an induced coma. Khan was awakened supposedly to aid the Earth against the Klingons in Kronos in case they attack. The movie suggests a potential sequel with this alien civilization retaliating against Earth after some of their soldiers were killed. Despite the possible suggested sequel, there were no extra scenes after the credits were rolled. Bending the rules isn’t anything new as the old series had all too many episodes with leaders violating Starfleet’s rules to save a crew member or an alien planet. Even the original Spock had given out information which may even alter the destiny of the new crew, hence, breaking the rules. The new Spock not only learned to feel in this film, he had also realized that some rules are broken to save a friend’s life. Even one’s life itself is offered in exchange for many, the way Kirk did when he hurried and aligned the ship’s energy source without gear and died of prolonged radiation exposure. Lucky for him at least, Khan’s super blood transfused to him saved his life, the way it did for a necrotic host (experiment) and the child of a London member of Starfleet (whom Khan used to infiltrate the Starfleet base). Aside from the ships, the same alien (err… make up and costume) species from other planets are also present as well as unchartered territories in space. Enter tree-like height for wheat grass in floral red color tended by natives in powder white skin covered by yellow clothing. Aside from the graphics and the adventure, you’d find the action particularly from Khan irresistible. This isn’t the best of the best Star Trek movie there is but it sure deserves your ticket in the movie houses. For the movie’s complete plot, cast/characters, and other information, you may visit the Star Trek Into the Darkness official website.